Photo shows the pothole-riddled junction leading to Kampung Bradau. KUCHING: The company that operates a quarry at the road leading to Kampung Bradau in Siburan near here has been asked to prioritise its corporate social responsibility (CSR) by maintaining the road regularly. Assistant Minister of Transportation Datuk Dr Jerip Susil said since the quarry operator had promised to maintain the road under its CSR, it should ensure the road surface is filled with gravel whenever potholes or puddles appear. He pointed out that the government had last year allocated RM500,000 to upgrade the road, with RM250,000 used to tar-seal a section in 2017, while the remaining RM250,000 would be released this year. However, Dr Jerip said the quarry operator must be more responsible in fulfilling its CSR since the road was damaged by heavy trucks carrying gravel from the quarry. “The quarry operator should be doing the maintenance regularly and not wait until the road condition worsens. 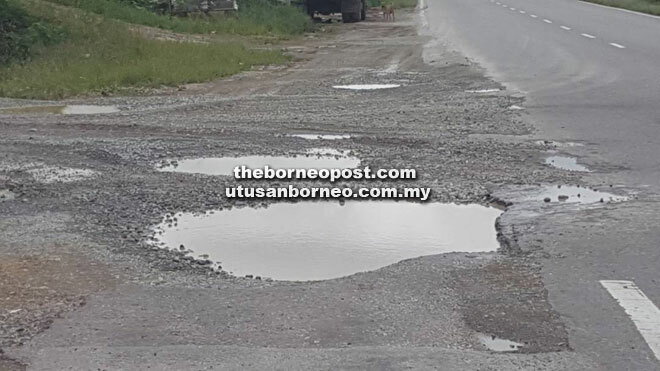 It is part of their CSR and they must fulfil it by filling the potholes and puddles whenever they appear,” he said when responding to an article published in The Borneo Post on Friday. The Mambong assemblyman said the quarry operator could also help by laying a thicker layer of gravel along the road surface to strengthen its foundation prior to tar-sealing work. “Even if the road is tar-sealed, potholes and puddles will still appear because the road foundation is not strong enough to cater for the heavy-laden lorries. “As the damage along the road is mainly caused by heavy-laden lorries transporting gravel from the quarry, the operator must do its part to lay a thicker layer of gravel,” he said. Dr Jerip also reminded villagers to write an official complaint to him so he could take further action. Kampung Bradau folk had on Thursday appealed to the relevant authorities to take over the gravel road leading to their village. Crying foul over what they described as an unending “road of potholes and puddles”, they complained that the quarry operator had failed to carry out its CSR.